Foie gras is a French gourmet delicacy. It is delicious and extremely fatty. Foie gras” translates to “fatty liver” in English and in order to make it, geese or ducks are forced-fed large amounts of a wet mash of corn. Their livers balloon up to about 6-10 times their normal size and are packed full of fat. This serves as a clear picture of the fattening effects of carbs and how it promotes a fatty deposition in the liver. It also explains the epidemic proportions of nonalcoholic fatty liver disease (fatty liver for short) that we are seeing nowadays. For the most part mainstream doctors ignore how to treat or deal with this condition and a lot of folks are left in the dark as to the real reasons behind fatty liver. So I decided to approach the subject for a clinical session with peer reviewed journal articles as a back up. I was amazed to discover how much information is out there! How on Earth it doesn’t reach every single individual in this world is beyond me. Nonalcoholic fatty liver disease (NAFLD) or fatty liver for short, is an accumulation of fat in the liver in individuals who do not consume significant amounts of alcohol (<20 g ethanol/d) and in whom other known causes of steatosis (“fatty change”), such as certain drugs, viruses, and toxins, have been excluded. The spectrum of this condition includes steatosis (type 1), steatosis plus inflammation (type 2), steatosis plus liver cell (hepatocyte) injury or ballooning degeneration (type 3), and steatosis plus sinusoidal fibrosis and/or Mallory bodies (type 4). Nonalcoholic steatohepatitis (NASH) is considered to be the most severe form of fatty liver (types 3 and 4) and is associated with several clinical outcomes, including cirrhosis, liver cancer (hepatocellular carcinoma), and advanced liver disease, which leads to liver-related death. NASH is now recognized as the underlying cause of most cases of cryptogenic cirrhosis, that is, severe liver disease where no other reason for severe liver damage is found. The highest prevalence of fatty liver currently is in the age group of 40 to 60 years. Approximately half of the patients with NASH develop liver fibrosis, 15% develop cirrhosis, and 3% may progress to liver failure or liver transplantation. Those who have undergone liver transplantation for end-stage liver disease secondary to NASH have frequent recurrence of steatosis and NASH even after transplantation. Fatty liver is basically the most common cause of chronic liver disease in the developed world. It affects 70 million adults in the U.S. (30% of the population) and it is expected to reach epidemic status by the year 2030 where 50% of the U.S. population will have it. >35 kg/m2) have steatohepatitis, the most severe form of fatty liver. A higher prevalence of hepatic steatosis is found in Hispanics (45%) compared with Caucasians (33%) or African Americans (24%). Elevated sugar levels stimulate the pancreas to produce insulin which is a hormone responsible for nutrient storage. A diet high in carbohydrates leading to chronically elevated levels of blood sugar and insulin is at the main root of fatty liver. That is, insulin resistance is the key mechanism in fatty liver. Insulin resistance is directly proportional to severity of steatosis. Fatty liver represents a liver manifestation of the metabolic syndrome which features insulin resistance at its core and which includes central obesity, high blood sugar, low good cholesterol (HDL), high blood pressure, and hypertriglyceridemia. People on a low carb diet have better liver function compared to those on a high carb diet for weight loss, despite when both groups may equally lose weight. In most case series of fatty liver, diabetes is present in 30% to 50% of patients. High blood cholesterol also is associated commonly with fatty liver, found in up to 92% of patients who have fatty liver. Obesity itself represents a chronic, inflammatory condition where there is an expansion of central/visceral fat which is infiltrated by inflammatory cells, which then leads to fatty liver and a state of heightened insulin resistance and increased oxidative damage. Fatty liver is an independent predictor of cardiovascular disease – a stronger predictor than peripheral or visceral fat mass. . Moreover, in study involving 11,091 individuals, it was shown that fatty liver, as diagnosed by ultrasound, strongly predicts the development of type 2 diabetes regardless of insulin concentration. That is, in a large population of relatively healthy individuals, identifying fatty liver by ultrasound predicts the development of type 2 diabetes in five years. The role of fructose and sucrose (which is 50% fructose) in metabolic disorders has been reviewed extensively. Dietary fructose consumption in industrialized countries has increased in parallel with the increase in fatty liver, obesity, and diabetes and there is a direct association. The increased consumption of high fructose corn syrup, primarily in the form of soft drinks, is linked with complications of the metabolic syndrome and an increase in liver enzymes. Unlike glucose, fructose stimulates de novo fatty acid synthesis directly and promotes weight gain. Fructose is also different from glucose in its ability to induce features of metabolic syndrome (insulin resistance, fatty liver, dyslipidemia, and intra-abdominal fat accumulation) both in humans and laboratory animals. The mechanism whereby fructose induces fatty liver appears to be independent of total energy intake. Data from prospective and intervention studies clearly point to high fructose consumption, mainly in the form of sweetened beverages, as a risk factor for several metabolic diseases. In a short (2 wk) dietary intervention study in fatty liver subjects, it was showed that carbohydrate restriction (<20 g/d) was significantly more effective in reducing liver fatty content than the restriction of calories to 1200-1500 kcal/d (55% vs 28%, respectively), despite the fact that both interventions similarly reduced body weight (by about 4.3%). 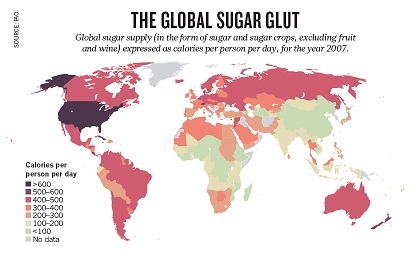 Over the past 50 years, consumption of sugar has tripled worldwide. In the United States, there is fierce controversy over the pervasive use of one particular added sugar — high-fructose corn syrup (HFCS). It is manufactured from corn syrup (glucose), processed to yield a roughly equal mixture of glucose and fructose. Most other developed countries eschew HFCS, relying on naturally occurring sucrose as an added sugar, which also consists of equal parts glucose and fructose. Authorities consider sugar as ‘empty calories’ — but there is nothing empty about these calories. A growing body of scientific evidence shows that fructose can trigger processes that lead to liver toxicity and a host of other chronic diseases. A little is not a problem, but a lot kills — slowly (see ‘Deadly effect’). If international bodies are truly concerned about public health, they must consider limiting fructose — and its main delivery vehicles, the added sugars HFCS and sucrose — which pose dangers to individuals and to society as a whole. Parallels with Ethanol J. Am. Diet. Assoc. 110, 1307-1321 (2010). But the problem doesn’t end with sugar. While a diet high in carbohydrates leading to chronically elevated levels of blood sugar and insulin is at the main root of fatty liver, there are other culprits, such as trans fats. Trans fats typically found in animal products do not have adverse effects on cholesterol profiles. On the other hand, trans fats from hydrogenated oils such as margarine, induces endothelial dysfunction and unfavorably alter cholesterol levels by increasing the bad: good cholesterol ratio and the total cholesterol: good cholesterol ratio. (LDL:HDL, TC: HDL). Excess insulin triggered by a high carbohydrate diet strongly influences a pro-inflammatory response in the body, especially when coupled with excess omega-6s fatty acids from vegetable oil and hydrogenated oils. In the BBC documentary “The Men Who Made Us Fat” (available here), Jacques Peretti refers to America as the home of the most profitable food industry in the world. He goes there to find out about the low fat scam, since if there is a way to get us to buy more food is probably being tried in America first. He interviews Pierre Chandon, visiting professor at Harvard Business School who has studied “The Paradox of Low Fat Food and High Fat People”. Chandon noticed how people basically tried so hard to lose weight while trying to eat the right things (recommended by their caring governments) and they still couldn’t manage to lose weight. He thought, there is a problem with the healthy food! Well, yes of course there is!! Chandon summed up the problem as “if people think something is healthy, they think it has fewer calories and eat more of it”. Never mind that the root of the problem is not really about quantities of calories but qualities of calories! According to Chandon, “Today it’s almost impossible to buy food that’s not saying it’s healthy. The paradox of low fat food and high fat people is not going to go away. I think it’s going to get worse.” And the greatest mistake was to believe that it was solely our fault when it is clear that it wasn’t. The BBC documentary also makes a pretty good job showing how the sugar lobby once threatened the World Health Organization of withdrawing their 406 million funding if they set a limit on sugar, so they didn’t. See how food policy gets dictated? As Professor Simon Capewell from the University of Liverpool puts it, putting the food industry at the policy table is like putting Dracula in charge of the blood bank. Their money resources are of massive proportions and they are able to stop dissent by tactics such as menace of removing food jobs in the constituency areas of politicians if they carry on with a policy that will affect the food industry. It is really a laser-like precision to remove dissent against the Giants – The Food Industry. The conflict of interest is massively outrageous. Instead of admitting that the Food Industry is part of the problem, it is put to provide for a solution. “From your shareholder perspective, would you like to suggest how we take forward food policy in this country?” How is that for a bias? Not remotely interested on health, but on business profiting, the Food Industry is capitalizing on the obesity epidemic and your suffering by manufacturing processed foods which are dubiously marketed as healthier. Saying that a cereal “contains calcium” in glowing letters in front of a cereal box is outrageous to say the least, when in fact it is full of sugar that will cause you osteoporotic bones. Or how about the health-epitome Olympic Games celebrated in London last year courtesy of your sponsors: chocolate brands, sugary drinks, etc. Or the UK government endorsed Cadbury’s sporting campaign where you have to eat a ton of chocolate in order to get a basketball for free. It is a profit scheme in the middle of a health catastrophe which only has an obligation to the shareholders and their profits. Of 206 relevant studies, 111 declared their source of funding. Of this 111, more than half (53 per cent) were funded in full or in part by the food industry. 52 studies had no funding from the food industry. […] In studies which were interventional in nature (which usually meant giving a beverage to individuals to assess its effects), 37 per cent of non-industry-funded intervention studies showed evidence of adverse effects. In contrast 0 out of 16 (0 per cent) industry-funded intervention studies found evidence of adverse effect. Studies funded entirely by industry were more than 7 ½ times more likely to report favorable results than those which received no industry funding. Low-carb ketogenic diets are effective for weight loss, seizure disorders, and a host of other neurological diseases. Attention has focused on the use of low carb diets and their efficacy in controlling metabolic diseases including obesity and fatty liver. A ketogenic diet has led to significant weight loss and histological improvement of fatty liver disease . A ketogenic diet – a diet based on animal fats – is the one thing that could put an end to this nightmare. (For more information on the ketogenic diet, check out the threads in Sott.net‘s forum “Life Without Bread” and “Ketogenic Diet“). And considering that there is no evidence for concluding that animal saturated fat is associated with an increased risk of cardiovascular disease, then there is simply no good reason at all to fear animal fat . Erin Marie McCarthy. The Role of Diet and Nutrient Composition in Nonalcoholic Fatty Liver Disease. Journal of the Academy of Nutrition and Dietetics. 2012;112:401-409. Zivkovic et al. Comparative review of diets for the metabolic syndrome: implications for nonalcoholic fatty liver disease. Am J Clin Nutr 2007; 86:285-300. Tendler et al. The Effect of a low-carbohydrate, ketogenic diet on nonalcoholic fatty liver disease: a pilot study. Dig Dis Sci (2007) 52: 589-593. Please please, if you tackle the subject of fructose saying how bad it is – and as hfcs it is assuredly very bad – then can you put fruit consumption into the discussion? Fruits are full of fructose. Are fruits bad for us? I understand that eating fruits and the fructose within them means we don’t need any release of insulin since the fructose in fruits needs no further breaking down into glucose. Assuming fruits are not bad for our health, then how can fructose be so bad for us? 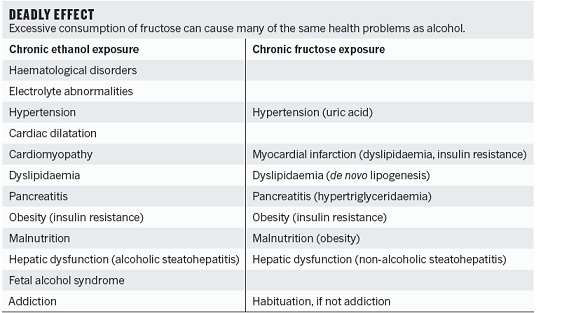 Distinctions really need to be made about what fructose is bad for us and what is not. My request for this aspect of fructose and sugar to be addressed is because i read so much about it being bad, but no mention of the fructose in fruits. And the caveman’s life is often put forward to support an animal-based diet, but did humans not begin life in the tropical belts of the world? If so, they would surely have had plentiful supplies of fruits and berries. It is great to read your articles, but this aspect of diet seems difficult to resolve. Based on the experience of numerous people in the ketogenic diet, including mine, fruit is just downright evil. I have tested it and regretted it every time I tried some. According to MyPyramid.gov, we should eat about 2 cups of fruit per day as a part of a healthy diet. But keep in mind that we’ve been cultivating fruit (and only some fruits) for only the past few thousand years, (many fruit trees for only the past few hundred years) and the fruit that we see today – Fuji apples, Bartlett pears, navel oranges – have been recently bred to be far sweeter than the wild varieties and hence, they are more fattening due to their higher fructose content. That is to say that eating fruits wasn’t the main diet of primates in Africa and the main element sought by the consumers, leading to their development as species, was protein. Further, I should point out that fruit-eating creatures didn’t evolve into human beings as primates exposed to harsh or unusual conditions did. Read the Aquatic Ape Hypothesis (http://www.amazon.com/Aquatic-Hypothesis-Condor-Indep-Voices/dp/0285635182) for some very good and eye-opening arguments for how and why humans evolved as they did. In short, if you want to devolve to a monkey, eat more fruits. Having said that, I’m still open to low sugar fruit on Summer, when it is more physiological to have some. But even then, I’m not sure. I will still have my treats of wild berries in season. fruit with fiber is good but fruit ice in large amounts without fiber is comparable to sugar – natural sugar vs high fructose corn syrup or other man-made / modified versions. I did a low carb diet a couple of years back. My cholesterol spiked. I believe the CSIRO diet is the most healthy. It’s not about weight loss, but about healthy eating. David, and was it your total cholesterol and LDL? What happened to the triglicerides and HDL cholesterol. You see, LDL often rises, but it is the large particles (which are anti-inflammatory) that increases.